Cervus Defence and Security Ltd announces the release of HIVE during ITEC 2018. HIVE is a training data exploitation system that harvests, categorises, stores, processes and analyses a vast amount of training data – including inputs from across Live, Virtual and Constructive environments. Cervus believes that HIVE will be unparalleled in its adaptive ability to harvest, categorise, store, and analyse data from collective training environments. More than that, HIVE will deliver genuinely comprehensive and exploitable insights via its innovative machine learning engine and unique visual reporting systems, thus allowing commanders to quickly spot and interpret trends from training, gain context-derived insights from them, and to identify rapidly and clearly opportunities for enhancements to warfighting. Through our Force Development contracts, we are developing HIVE as a response to an obvious need to capture, store and interpret large amounts of training data. HIVE will be the first of a suite of collective and individual training data collection, storage and analysis tools we will be bringing to the market over the next 24 months. 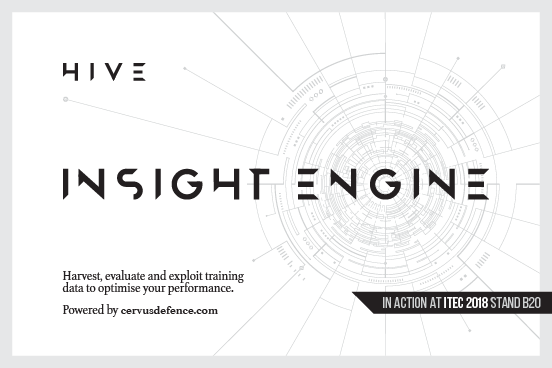 We believe that HIVE would transform any Army’s training support process from one of necessarily reactive and descriptive observation to one of insightful, predictive and prescriptive intervention: enabling a virtuous ‘Train-Fail-Learn-Train-Succeed’ cycle. Our aim this year is to demonstrate the key benefits the Army seeks as it aims, via the CTTP, to deliver a Future Collective Training System for the Army of 2025. Come and meet the Cervus team on Stand B20 or reserve an appointment through our contact page.